When I discovered the Boys of the Lough in the late seventies, one of the things I liked most about the band was the pure, clear, high tenor singing of Cathal McConnell. A year or two later at the Sidmouth Festival – I’m guessing 1979 or 1980 – I came across a singer with a similar style, but who I would rate even higher. That singer was Kevin Mitchell, born in Derry, but for a long time a resident of Glasgow. I had no hesitation in buying his Topic LP Free and Easy when I subsequently came across it in Blackwell’s Music Shop in Oxford and, as I recall, I didn’t waste much time in learning this song from it. Known better as The Airy Bachelor or The Black Horse (O Lochlainn, ”lrish Street Ballads”, no. 17) this has been widely distributed on ballad sheets and is common, especially in Donegal, whence this version obtained from John McCracken of Innishowen. The “Songs of the People” contains a song called The Hungry Army. The title is, intended or not, a pun; the army composed of underpaid, badly treated, hungry men, or the army hungry for recruits to replace those who fell in battle, deserted, died under the lash or from disease. Sergeant Acheson is just such a recruiting officer as contrived by dint of cajolery, chicanery or sometimes criminality to feed it. The Black Horse is, according to Sam Henry (“Songs of the PeopIe”, no. 586), a by-name for the 7th Dragoon Guards – The Princess Royals. Several printed versions can be found at Ballads Online, with titles such as A new song called the Black Horse or A Much-admired Song Called the Black Horse. All the versions collected from the oral tradition are, unsurprisingly, Irish, with the exception of the rather confused fragment, You Lads of Learning, recorded in Ludlow from May Bradley. An admired song called the Black Horse – nineteenth century ballad sheet printed by Haly, Cork; from Ballads Online. Kevin Mitchell is, as far as I know, still singing like an angel, although it’s unfortunately some years since I last saw him. I have a very distinct memory of a singing session at the National Folk Music Festival at Sutton Bonington in the early 1990s, when the Sussex singer Gordon Hall – a big, bluff man, but a real softy on the inside – was moved almost to tears by the beauty of Kevin’s singing. Putting the recent pea-soupers to one side, there have been some very spring-like mornings this week, so in a spirit of optimism I thought I’d post this song. It’s another one from the great Pop Maynard, learned from the Topic LP Ye Subjects of England. It’s a song which I think of as being quintessentially Southern English. 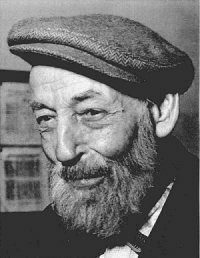 That impression is partly based on only having come across the song from George Maynard and the Copper Family – but in fact having looked up Roud 356 on the Full English site I see that it has been exclusively collected in Southern England, with most of the sightings coming from Sussex. I should perhaps confess that, while I love this song, I can’t relate to it fully having, as far as I’m aware, never actually heard a nightingale. This is a proper traditional ballad where all the main characters end up unhappy and/or dead. Just for once, it features a young lady whose parents approve of her choice of life-partner but, needless to say, there’s a fly in the ointment. In this case it’s her brothers, who want her to marry a rich young lord. They promise to kill her unsuitable suitor, and are as good as their word, inviting him a to a fair, then doing him over with a couple of sticks (although in the interests of efficiency, and preserving the internal rhyme scheme, they might have done better to have used knives). I learned this from an Irish traveller, Josie Connors, via the VWML cassette Early in the Month of Spring. This cassette presented recordings of Irish travellers made by Jim Carroll and Pat Mackenzie in various unromantic locations (e.g. an illegal camp underneath the Westway flyover in North Kensington) in and around London – Josie Connors, I think was recorded at Langley, near Slough. Most if not all of those recordings are now available on the Musical Traditions CD From Puck to Appleby. The plot of The Constant Farmer’s Son was used in the 14th century by Boccaccio in The Decameron and later made the subject of poems: by Nuremberg poet Hans Sachs in the 16th century and, in the early 19th century, by John Keats in his Isabella and the Pot of Basil. Based on an older song, The Bramble Briar or Bruton Town, which has been described as ‘probably the song with the longest history in the English tradition’, it owes its continued popularity to its appearance on nineteenth century broadsides. A version from Hertfordshire in 1914 gives it as ‘Lord Burling’s (or Burlington’s) Sister or The Murdered Serving Man. As well as being found widely in England, it is very popular in Ireland, though it has only appeared in print there a couple of times. It is included in the Sam Henry Collection which gives four sources and, more recently it was included in Fermanagh singer John Maguire’s autobiographical Come Day, Go Day, God Send Sunday. Josie learned it from her mother, a Dublin Traveller. About twenty years ago I sang this song in a ballad session at Sidmouth. The collector Keith Summers was sitting near me. When I’d finished the song he just leaned across and said “You got it boy”. That’s one of those cryptic remarks which I may well have misinterpreted, but I’ve always taken it as a huge compliment from a man who had spent an enormous amount of time in the company of traditional singers. 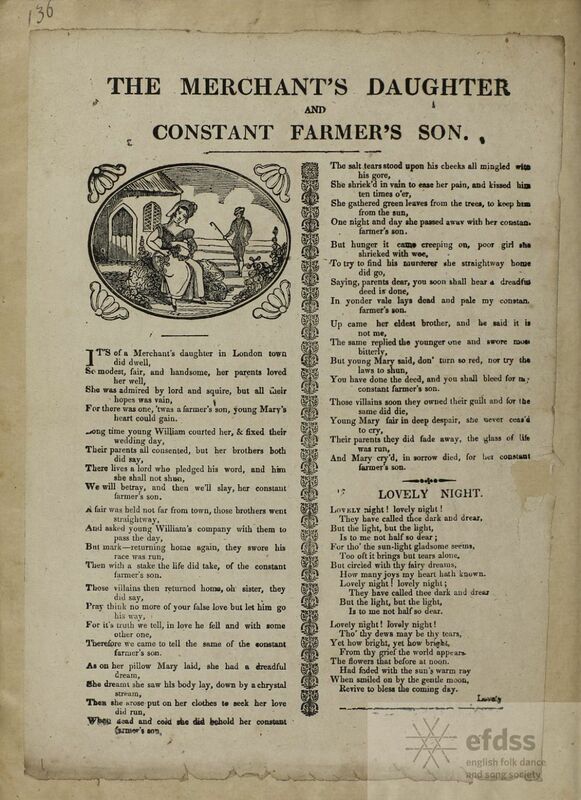 The Merchant’s Daughter And Constant Farmer’s Son – ballad sheet from the Frank Kidson Manuscript Collection, via the Full English archive. The first folk record of any description that I heard was Below the Salt by Steeleye Span. The next were probably All Around My Hat and Ten Man Mop by Steeleye Span, and Folk Songs of Olde England Volume 1 by Tim Hart and Maddy Prior, who were of course members of – yes you’ve guessed it – Steeleye Span. I did then start to branch out a little, with LPs by the Watersons, Planxty, the Chieftains, and even, within twelve months of my conversion to full-blown folkiness, the Copper Family. But it would be hard to deny that Steeleye, and Tim Hart and Maddy Prior, had a massive influence on my developing musical tastes. As a seventeen year old I suspect my singing voice was a rather curious and unlovely amalgam of Mike Waterson (inimitable, and therefore definitely not someone a Kentish schoolboy should have tried to imitate), Tim Hart (who I later discovered had adopted a fake yokel singing style because he thought his own voice was too posh for folk songs) and Martin Carthy at his most mannered. I have, I hope, moved on. This Cumberland sung is an amalgamation of three versions collected by Geoff Woods of Leeds between 1945-1967. It is believed to have been written by Willian Graham, “the Cumberland poacher”. The word “lish” is Cumberland dialect for active or brisk, and “buy-a-broom” is a tinker. Clearly Reinhard has a different version of the record to me – my 1976 Mooncreast reissue has no notes about the songs at all. 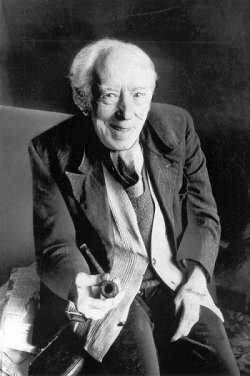 I was pleased to find that there was an extra verse – the one which ends “She said: My gay young fellow you shall play my little drum”, which is the kind of line you wouldn’t want to leave out. 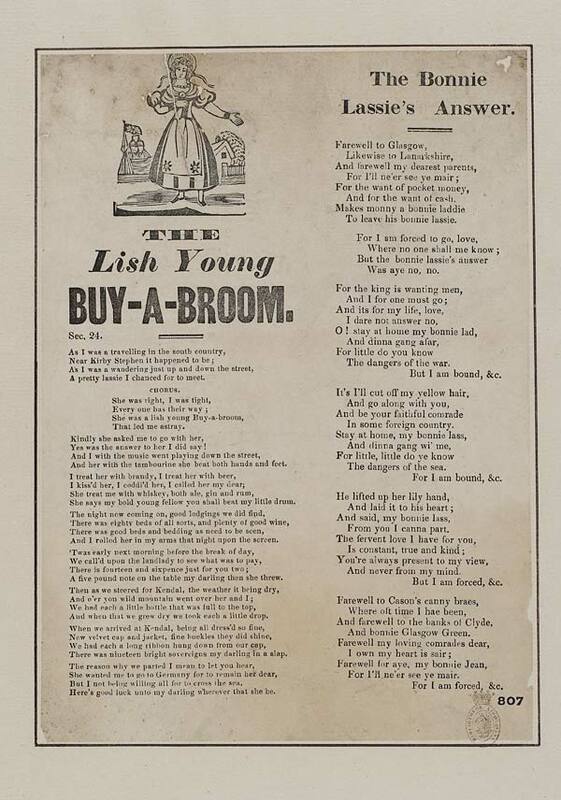 Lish Young Buy-a-Broom – mid-nineteenth century broadside printed by Harkness of Preston, from the National Library of Scotland website.